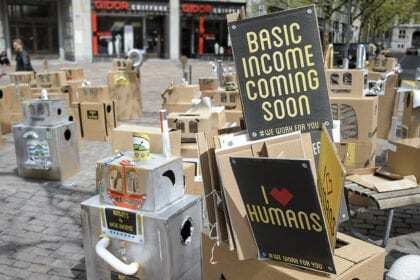 EDITORIAL: Does Greater Awareness of Basic Income Increase Support? I occasionally hear it asserted that increased familiarity with basic income tends to increase individuals’ support for the idea: as people learn more about basic income, they become more likely to endorse the idea. It is important to clarify the apparent source of this claim and why, given this, it is actually baseless. As far as I’ve been able to deduce through my following of the discussion of basic income, the claim originated through a misinterpretation of the results of a survey conducted by Dalia Research in March 2016. The survey was a milestone in public opinion research on basic income: the first EU-wide opinion poll on basic income, featuring a representative sample of 10,000 Europeans across 28 countries. 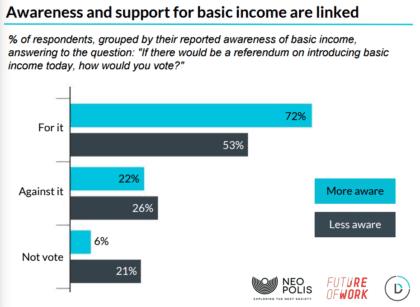 Its scope, as well as its encouraging results (64% of respondents said that they would vote for a basic income referendum in their country), led to its wide dissemination within the basic income community. 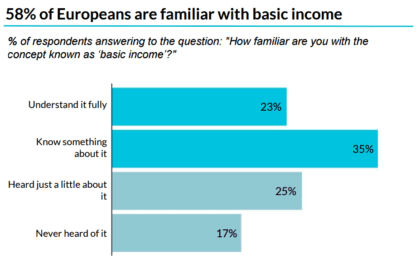 In a summary of survey results, researchers reported the additional finding that “Europeans who said they were aware of basic income were also more likely to report that they would vote for it.” This claim, as stated, is accurate. However, it tends to implicate an additional claim that is not substantiated by the survey: the causal claim that awareness of basic income increases support for it. It’s important here to understand the design of the survey in a bit more detail. In the first question, subjects were asked, “How familiar are you with the concept known as ‘basic income’?” (without no definition of ‘basic income’ provided). Subjects were then posed the question “If there would be a referendum on introducing basic income today, how would you vote?” (“for it,” “against it,” or “not vote”). As part of their analysis, Dalia Research broke down the responses to the latter question by level of awareness as measured in the first question: “More aware” (corresponding to responses of “Understand it fully” and “Know something about it” on the first question) versus “Less aware” (corresponding to “Heard just a little about it” and “Never heard of it”). To cite the well-known Statistics 101 maxim, however, correlation does not imply causation. The finding that awareness and support for basic income are “linked” does not entail that higher awareness is the cause of support. In the present case, in fact, it’s easy to imagine a causal relationship in the opposite direction: plausibly, those who find the idea of basic income appealing are more motivated to research and learn more about it. (Indeed, this probably describes many of us who follow Basic Income News.) Moreover, to give another potential explanation, those who are generally interested in and supportive of progressive policy might be relatively likely to read publications that discuss basic income–and thus to learn about the concept–as well as being relatively likely to vote in favor of such a policy. Whatever the underlying cause of the observed statistical relationship, one cannot cite the Dalia Research survey to support the assertion that awareness of basic income increases support. The survey simply did not test this causal claim, and thus provides no data on it. Does Support Increase with Awareness? How might one test the causal claim? One possibility might be to select individuals who initially report no knowledge of basic income, provide a short description of the policy, conduct a “pre-test” of their attitudes, provide more information about the proposal, reassess their attitudes toward the idea, and so on–making the imparting of information about basic income an experimental intervention. To my awareness, no such study has been conducted (although a 2016 survey of San Francisco voters, discussed below, comes close). Given what we do know, however, it is unreasonable to infer that increased familiarity with basic income is sufficient–or even reliable–to generate increased support. First, let’s consider the “real world” case study of the Swiss referendum. On June 5, 2016, citizens of Switzerland voted on a referendum that would have introduced an article in the federal constitution mandating a government-funded “basic income” sufficient to “allow the people to live in a dignified manner and participate in public life.” The referendum was defeated, with 23% of voters in favor. This final result suggests, if anything, a decline in popular support–compared, for example, to an April 2016 survey that indicated that 40% of Swiss voters were inclined to vote “yes” on the referendum–despite the fact that the basic income referendum continued be heavily publicized and debated between April and June (leading, presumably, to increased awareness). Finally, let’s look at a survey of 500 likely San Francisco voters conducted in April 2016. 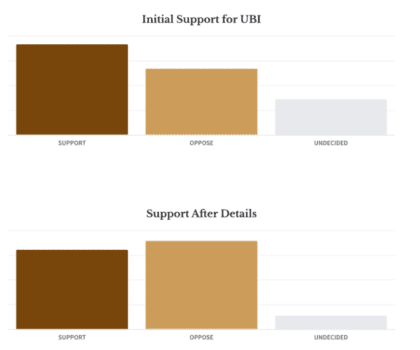 In contrast to most opinion polls on basic income, the San Francisco survey did attempt to discern the impact of increased understanding of basic income (initially called ‘base income’ in the survey) on support for the idea. At the start of the survey, subjects were asked “Do you support or oppose providing every resident of the United States with a base income?” No further elaboration on the concept of a “base income” was provided. This is not, precisely, a test of the effect of increased awareness on support for basic income. For one, the terminology was alerted, with the usual term ‘base income’ used in the initial question. Additionally, we cannot be certain that the survey questions had the effect of imparting new information to respondents: in some cases, the additional questions might merely have had the effect of raising the salience of previously known information, which happens to cast a less favorable hue on the idea of implementing basic income. By way of example, surveys conducted in recent years in Finland and Canada indicate that support for basic income decreases when respondents are requested to entertain the idea of funding it through tax increases. In these cases, plausibly, it’s not that respondents did not previously believe that at least part of the funding for a basic income would come from tax dollars; it could simply be that this consideration was not salient when they were first asked, in the abstract, whether they favored the idea of a basic income. We might note here, however, that 51% of respondents the San Francisco poll claimed to know “nothing” about universal basic income prior to the survey. Thus, it is quite likely that, for a majority of respondents, the questions on policy specifics did have the effect of introducing more information (not merely, that is, increasing the salience of old information or existing beliefs). In this light, the San Francisco survey not only fails to confirm the claim that greater awareness leads to greater support, but also supports the opposing claim that greater familiarity with the idea of a basic income tends to lead to a decrease in support (at least in the population studied). Overall, we still know very little about the effect of awareness on support for basic income. To my knowledge, however, there is no sound empirical basis for the claim that awareness increases support–outside, perhaps, of anecdotes and hearsay. San Francisco survey visuals: Misha Chellam (Dec 19, 2016) “Could universal basic income start with local and state legislation?” Medium. Methodological details of San Francisco survey confirmed by Seiji Carpenter of David Binder Research. There is not just the Dalia survey showing that the more people claim to know about UBI, the more they support it. Poll surveys in France and Slovenia have shown that too. Regarding the poll in San Francisco, I find it not surprising and neither contradictory with the other findings. I think it takes more than a few seconds on the phone to fully support such a radical concept as UBI. At first sight people tend to think of UBI as a minimum income or minimum wage, which is quite broadly consensual. Then when they are explained that it’s universal and unconditional, a lot of people would find themselves at discomfort with the idea. Therefore I’m not surprised that the correlation is negative in this scenario. The real question is the correlation between people who really know about the topic and have thought about it, and how many of those support its implementation. The problem, I think, is we don’t exactly know how many of the people who claim to be aware about UBI actually do know what is is exactly. I suspect the Dalia conclusions are highly over-optimistic on this. We would need some kind of random check where people who claim to be familiar with UBI, when people would be asked some random questions about its basic principle of UBI. Only then we can draw accurate conclusions. Thanks for mentioning the surveys in France and Slovenia. I’ll look into them, certainly, but my guess is that they show the same thing as the Dalia survey: that awareness and support “are linked” — NOT that awareness increases support. What I do know is that basic income supporters, pointing to the Dalia results alone, have said, “Look, if we make people more aware of BI, they’ll be more likely to support it.” But that is to confuse correlation with causation. My point is simply that the causation claim cannot be inferred from a poll like Dalia’s (and maybe the French and Slovenian ones as well); these show ONLY correlation. It’s not that the Dalia conclusions themselves are over-optimistic; it’s that supporters tended to pass them off in an overly optimistic — and baldly fallacious — way. You’re right the poll in SF does not contradict Dalia’s. I discuss it to highlight an important difference in the way it is structures. Despite its limitations (which I agree are many! ), it at least makes an attempt to use familiarization with BI as an experimental intervention or manipulation, which is the best one can to in designing a one-off survey to attempt to deduce any sort of causal conclusion. Some sort of longitudinal study, in which the same subjects are surveyed on multiple occasions throughout time, would be more desirable. Your proposal at the end sounds like a way to better objectify “familiarity”. I agree that different subjective meanings attached to this term are another problem with surveys such as these, so I’m glad you added that point. Once again, however, simply objectifying the terminology in a poll like Dalia’s would never get us to a causal conclusion, only a correlation. However, it is an independently helpful consideration. In a longitudinal study, for instance, it would be good to ask subjects something more objective and precise than “How familiar are you with the concept now?” each time they are interviewed. I also realized, after reading your comment, that I needed to retitle the article to make a bit sharper that the focus of this article is, specifically, the causal claim–not just the observation that awareness and support seem to be positively correlated. This is not a reply specifically on the post. More like my random thoughts in the night. The UBI comes in many ways. Isn’t it time to be more specific (more political) on the different parts of this reform? How the UBI is presented will decide the response. I support some versions, but others I don’t even take seriously. Most people will react alike. I’m sure. 2. Who will get it? Is it truly universal or would rich people be excluded? (read: is this a leftwingreform or not?). 3. To give people Money is not a problem, but exactly how will it be funded? What benefits will be slashed and what taxes will be raised, if any? 4. Society will change profoundly, what other adaptations would be/need to be implemented? Finally- why is the movement so afraid of admitting substantial tax raises? X billions are taken from the people in January, and X billions are given to the people in February. X billions are taken from the people in Febrauary, and X billions are given to the people in March. And so on. The question whether this reform is affordable or not is ridiculous. The money is never lost. The feasibility is determined by other aspects. Thanks for these random thoughts in the night, with which I find myself largely in agreement. My main purpose in writing this article was to, using a salient case study, agitate basic income supporters to disallow wishful thinking to blind them into fallacious reasoning or uncritical regurgitation of claims made on social media. For this purpose, I accepted the assumption that it’s reasonable to talk about individuals’ degree of support for “basic income” with no further qualifications. Yet I agree that is indeed fundamentally mistaken to survey individuals on their support or opposition to basic income simpliciter, as it were, instead of a specific policy proposal. As you correctly note, proposals for basic income vary widely along multiple dimensions. I also agree that we should accept–indeed, embrace–substantial tax increases (though that’s yet another article, for another time). I’m going to say let’s do what we can to properly make everyone aware of a Basic Income and at the same time counter the usual objections to it along the way. I’m going to take a leap of faith and say that in the end, once most people know what a Basic Income is and what it can do and that it doesn’t have any of the “downsides” people automatically think of, people will make an informed decision on the matter.